257 kW (350 bhp) and 440 Newton metres of torque. An electric motor that has also been integrated into the driveline adds up to an extra 200 Nm of torque. The study is making its debut at the 2005 International Motor Show in Frankfurt. It goes without saying that no Audi boasting such performance potential would be complete without quattro permanent four-wheel drive to convert all of the engine's power and torque into supreme levels of handling dynamics and driving safety. Power is directed to the wheels through a 6-speed tiptronic transmission. 120 km/h in 5th gear in 7 seconds flat. 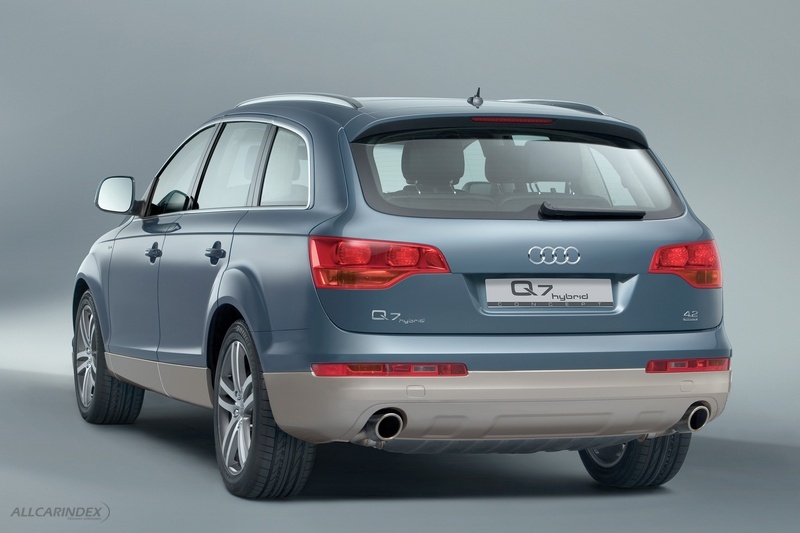 These compelling figures are made even more impressive by the fact that the Q7 hybrid tips the scales at 2,410 kilograms and returns fuel consumption figures of just 12.0 litres per 100 kilometres, nearly 13 percent less than the standard-production model: what better testimony to the efficiency of the Audi hybrid drive system? The concept study's fine all-round capabilities are underpinned by the effective blend of high-performance FSI engine and electric motor, plus, not forgetting of course, the intelligent energy management at work in the Q7 hybrid. After all, it is energy management that enables optimum use to be made of each drive unit's potential, resulting in superior performance going hand in hand with maximum efficiency. 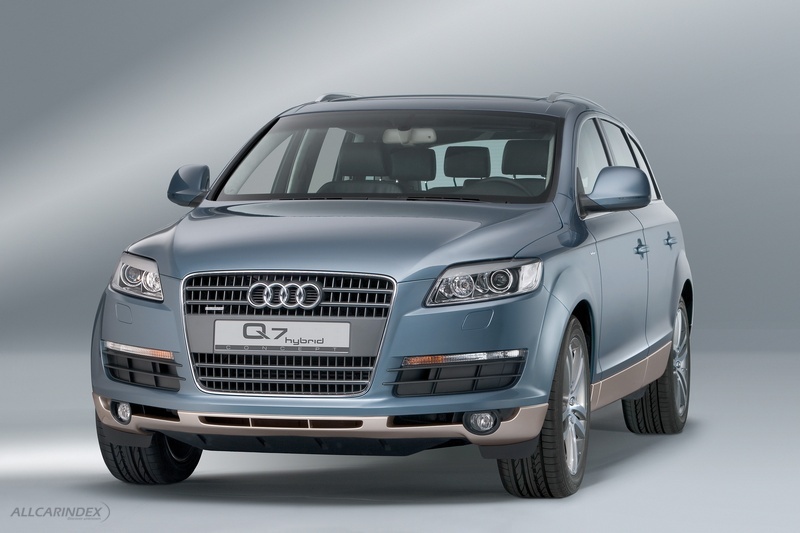 When the bonnet of the Audi Q7 hybrid is first opened, there are no immediate visible signs of its hybrid nature. The 4.2-litre eight-cylinder power unit takes up the entire engine compartment, with no trace of either an electric motor or a battery. The V8 engine is taken from the latest Audi V-engine range whose trademark characteristics include a cylinder angle of 90 degrees and cylinder spacing of 90 millimetres. A further distinguishing feature is the chain-driven camshaft. Unlike the conventionally powered models, the auxiliary air conditioning compressor and power steering pump units in the Q7 hybrid are powered electrically to ensure their continued operability when the vehicle is driving in pure electric mode. 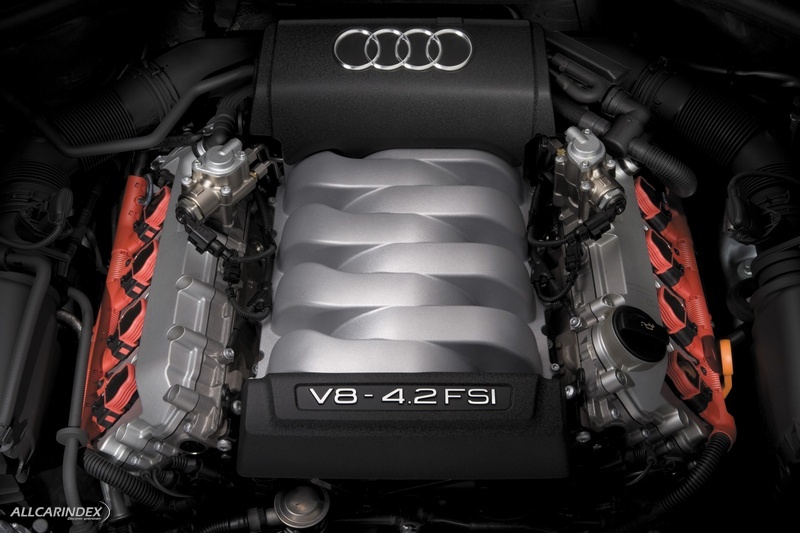 The V8 under the bonnet of the Q7 hybrid incorporates the same FSI direct-injection petrol technology featured in the RS 4 engine. This marks the first ever use in a series-production eight-cylinder engine of a technology which has powered the Audi R8 Le Mans racing car to five victories. FSI engines are more powerful and dynamic than conventional indirect-injection units whilst at the same time being a model of fuel economy. 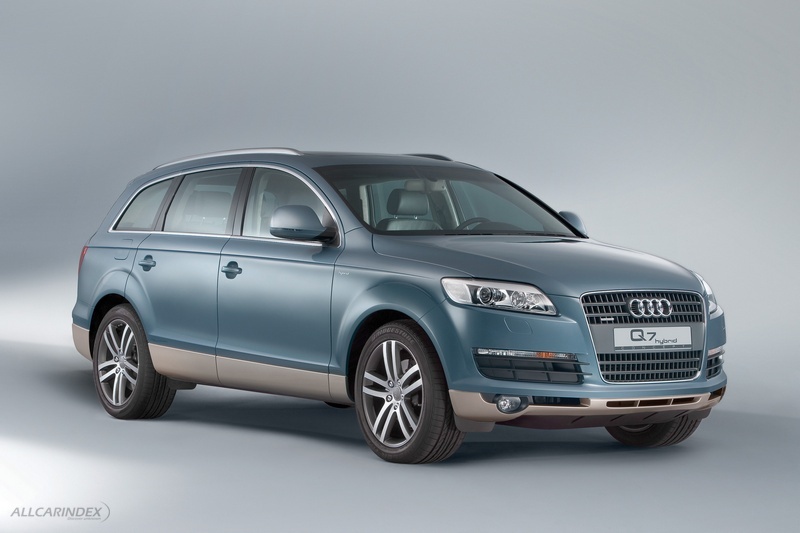 The V8 engine was retuned prior to being fitted in the Audi Q7. The new engine's credentials now include beefy torque delivery right up to the red line as well as agile responsiveness, all combined with economical running. These characteristics are partnered by a prodigious output of 257 kW/350 bhp at 6,800 rpm plus a peak torque of 440 Nm at 3,500 rpm. Placing a further 200 Newton-metres of torque and 32 kW of power on tap, the electric motor is integrated into the driveline in the ideal position, between the V8 engine and the automatic transmission's torque converter. It is linked up to the FSI engine via a separating clutch that allows the vehicle to be propelled by either one of the drive units alone or by both acting in unison. This solution makes the most economical use possible of the space available, meaning that it does not impinge upon the passenger compartment in any way. 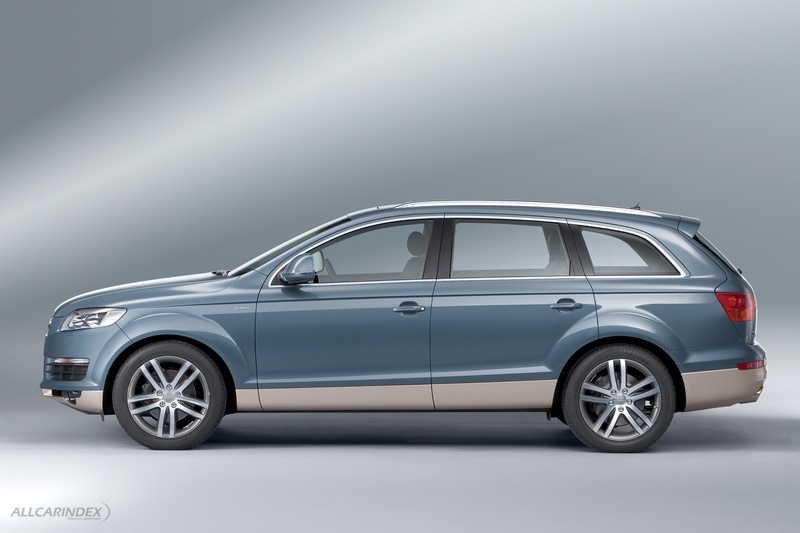 Like the standard-production version it is derived from, the Q7 hybrid offers up to three rows of seats and a spacious luggage compartment. The electric motor draws its energy from a battery system housed beneath the luggage compartment floor at the rear of the vehicle. A voltage transducer that supplies power to the vehicle's electrical system can also be found here. The tyre mobility system for repairing punctures has been incorporated next to the battery compartment. The V8 FSI engine is able to unleash 350 bhp and 440 Newton-metres of torque. This power alone is enough to accelerate the standard-production Q7 from 0 - 100 km/h in 7.4 seconds. If the driver is looking for even snappier response, the electronics engage the electric motor too. The concept study uses sunlight as yet another source of energy: the Audi development team has integrated solar cells into the open sky system - the SUV's large-format glass sunroof - which allow the ventilation and air conditioning systems to be operated when the vehicle is parked. 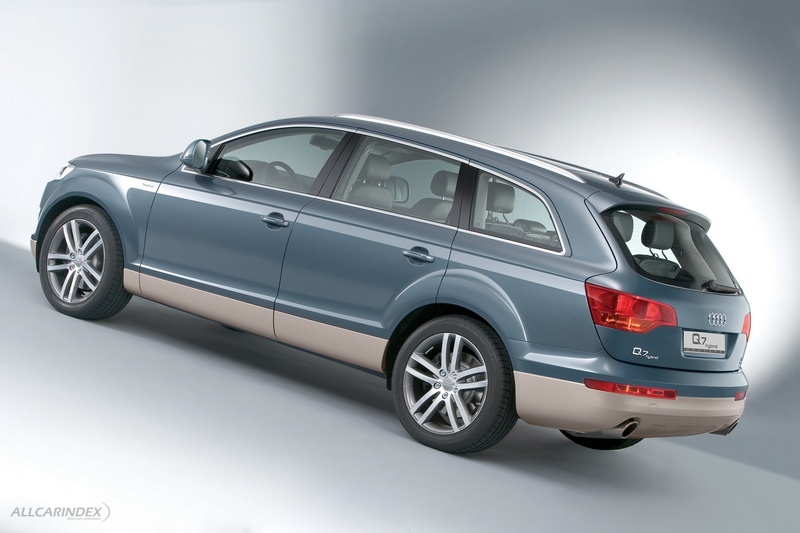 To this day, Audi remains the only European manufacturer to have series-manufactured a hybrid vehicle, an honour it has held since 1997 when it brought out the Audi duo based on the A4 Avant. Drive power was provided by a 1.9-litre TDI engine developing 90 bhp assisted by an electric motor with a further 29 bhp. Both delivered their joint drive power to the front wheels, with a lead-gel battery at the rear of the vehicle providing the necessary electrical energy. The first ever generation of the Audi duo was actually unveiled as early as 1989, however. The experimental vehicle built on the platform of an Audi 100 Avant quattro was equipped with a 12.6-bhp electric motor which was responsible for driving the rear wheels instead of the propeller shaft. Energy was sourced from a nickel-cadmium battery. A 2.3-litre five-cylinder engine delivering 136 bhp powered the front wheels.